I’ve had my share of Shiba escapes over the years, which is why I’ve written posts like Making the Most of Companion Identification Methods and Tagg – The Pet Tracker aka The Shiba Owner’s Peace of Mind. My youngest Shiba, Zuki, is a master escape artist though. I’ve never had to work so hard to keep a Shiba safe at home! When we first adopted Zuki, she escaped from the back yard a couple times. (We managed to catch her, but only because she escaped out the back and ended up in a huge flood ditch that she couldn’t get out of own her own.) She was going under the fence, so I had some guys attach chicken wire to the bottom of the fence and trench it into the ground, all the way around the yard – no more holes and no more digging! Everything was fine for a month or two until I came home from work one night and a cute little dog was staring at me from inside my neighbor’s back yard. I walked over to say hello and IT WAS ZUKI!! As soon as I got close to the fence, she leapt over the fence and into my arms. (My dogs live in the house. My daughter was home and had let Zuki outside just a few minutes before I came home and discovered her in the neighbor’s yard.) After that, we only let her out in the yard dragging a 15 foot training lead. We’d stay outside with her and, if she tried to jump over the fence, we’d grab the lead first. That worked great. Until one day when it didn’t. I was outside with all three dogs, Zuki decided to jump the fence, and I didn’t make it in time to stop her. I had to run through the house and out the front to chase after her. By the time I got out there, she was long gone. Luckily, with the help of neighbors, I tracked her down about 20 minutes later. The training lead still served a purpose too… I probably wouldn’t have been able to catch her if she hadn’t still been dragging it. After that, the rules changed again — Zuki could only be outside if one of us was holding the other end of her lead or it was secured to the house. That limited her outside fun though, and she stopped getting enough exercise. Enter my brilliant father and his excellent solution. For ~$100 we built a 100 foot cable run for her that gives her plenty of running room and keeps her safely inside the fence. Why not just use a stake tie out? First, I wanted something permanent, that I wouldn’t have to deal with removing every time the lawn guy comes to mow. Second, I wanted her to have a lot of running room, but not be able to reach a fence, so I needed a long thin space, not a circular space. Last, I wanted to minimize the possibility of her wrapping the cable around herself or anything else. 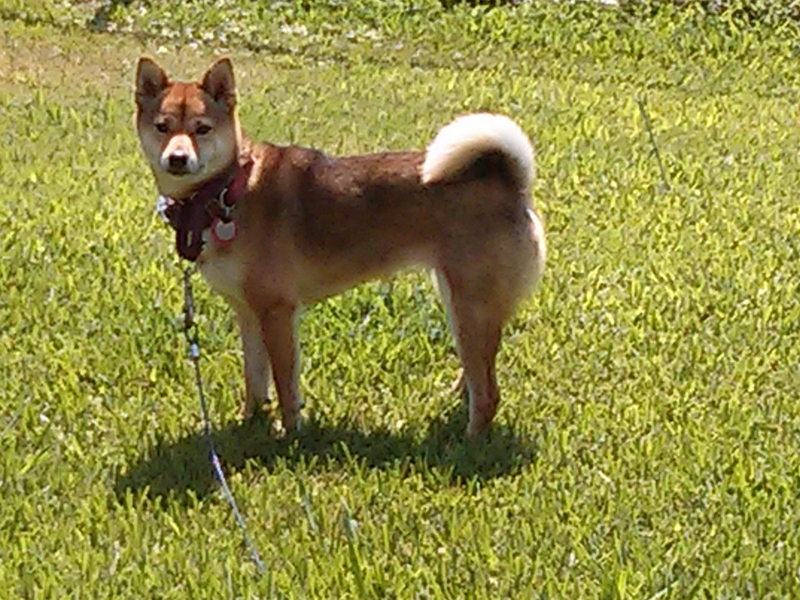 Recently, I was having an email conversation with a reader who has a young Shiba that escapes easily, like Zuki. She felt like restricting her freedom was making her more likely to look for ways to escape. She needed a way to safely give her pup some room to run. I suggested building a cable run like Zuki’s, which is what prompted me to put all the details together in this post. A hammer, screwdriver, ladder, and – if you’re like me and not handy at all – someone handy. Decide on two places to place the ends of the cable run. I chose to attach one end to my back door frame and the other end to a tree in the center of the yard. Be sure the cable doesn’t run too close to the fence or anything else your dog can jump over. You don’t want them to jump over something while cabled and end up hanging themselves! Screw the eye bolt screws in at each end, preferably at 90 degree angles to the eventual cable. Make sure you place them high enough that you won’t have to duck under the cable while walking through the yard. Take into account that the cable WILL sag some in the middle. Put one loopy thing through one eye bolt screw and run your steel cable through it. Use two of the chain rope clips here – one to secure the cable and loopy thing and a second to neatly hold the end of the cable. Consider whether you will need to stop your dog from reaching either end of the cable. If so, you’re going to need to place additional chain rope clips on the cable. (I did not need one on the end by the house, but I did place one about 20 feet from the tree at the other end.) Slide any necessary clips on the cable now, along with the pulley. Make sure you slide them on in the right order, so the pulley can run the full length of cable between whatever clips are necessary. Put the second loopy thing through the second eye bolt screw and thread the cable through it. Use two clips to secure the cable just like you did on the other end. This end is harder, because you have to pull the cable as tight as possible before screwing the clips on. We didn’t use any special tools for this – just our bare hands – and ours only sags a little. If our cable was longer than 100 feet, I think we would have needed a fence puller to get it nice and tight. If you’re using clips to stop the dog from reaching one or both ends of the cable, tighten them down now. I used one to stop Zuki from wrapping her tie out cable around the tree at the far end. Clip one end of the tie out cable to the swivel pulley. Clip the other end of the tie out cable to the martingale collar. Personally, I keep the collar hanging on the inside door knob of my back door. I slip the collar on Zuki before I even open the door. When she comes back in, I close the door (it will close with the cable running under it) before I slip the collar off. A note about collars: Never use a choke collar to tie out a dog. However, if you do all this work and then use a regular buckle collar, your dog may pull out of the collar and disappear anyway. This is why I use a martingale collar. Martingales should not be left on 24/7 or left on an unattended dog. They are meant to be used while walking. Be sure the martingale is sized properly. It should close tight enough that your dog can’t back out of it, but not so tight as to endanger the dog. Zuki wears a buckle collar 24/7 with her ID tags and Tagg Pet Tracker on it. The martingale only goes on when she is outside, supervised, on her cable run or when we’re going for a walk. Depending on your dog’s temperament, don’t be surprised if their new run freaks them out a little bit at first. Zuki was afraid of the sound the pulley makes as it whizzes along the cable. She would pull, it would whizz, she would sit down and looked freaked out. For the first week or so, we had to go out with her and walk along moving the pulley by hand. If she was out there alone, she’d stay by house and try to not move the pulley. Suddenly, one day, she just got it. Of course, shortly after that, she chased a squirrel and hit the clip near the end REALLY hard. Oops! It didn’t take her long to figure out what her range is though. Now she runs up and down as fast as she wants and – usually – slows down before hitting the end. We’ve found the "weak link" in this system… last weekend, I was watching Zuki in the yard and suddenly realized she was outside the part of the yard that she should be able to reach! Luckily, she’s learned a pretty good recall (when I’m shaking a bag of treats), so I got her back before she realized she was free to jump the fence. Turns out the pulley broke. (I will post a photo shortly.) For now, her tie out cable is simply clipped directly to the steel cable. It’s a little harder for her to pull back and forth, but it works. Jessica, you’re lucky. Mine are so prey-driven, it takes a lot to stop them when they are chasing something. Snick chased a squirrel over a five foot fence once… I swear it didn’t even slow him down! I’ve tried everything to keep my shiba, Suki, in the yard. She’s suddenly discovered this driving need to escape and will take her German Shepherd babysitter with her–he makes her return home. She digs, she climbs, she eats wood pickets, worms her way through chain link, and there are all manner of things a normal tie-out would get caught on (deck trees, etc.). I tried a kennel outside, but she would scream all day. Crating inside for hours on end was my final option until I read this. I can’t wait to try this out this weekend! Thanks! You are most welcome! I hope it helps you provide a safe and secure way for Suki to spend time outside. I strongly advise against leaving her unsupervised on it though. It’s a useful tool to have, but she could still manage to get in trouble if you aren’t watching her – potentially reach something you didn’t mean for her to, get stuck, jump over something and hang herself, etc. Your Suki sounds a lot like my Zuki – so much energy and so ready to make trouble! I have done several of these. When tightening the cable, get a turnbuckle or two for the ends. Pull the cable manually until it is as tight as you can get it. Then use the turnbuckles to really make it taut. Also, instead of a pulley, I used a steel ring. Nothing to break. You’re welcome Steve! I hope you’re able to set up a secure way for your dog(s) to exercise without worrying about that road. Just remember that there are multiple reasons to not leave your dog(s) unattended on a cable run. I recommend always staying where you can see them when they’re out there. Jenna this is a turnbuckle http://www.lowes.com/pd_22233-1277-DP2170BC_0__?productId=1167157&Ntt=turnbuckles&pl=1&currentURL=%3FNtt%3Dturnbuckles&facetInfo= they are very simple to use and if you can’t figure it out I’m sure the guys at lowes will help you. Also you have your cable saddles upside down. Do a google search on “don’t saddle a dead horse” and you will see what I am talking about. Otherwise great information! Your post gave me a great idea for the beagle we just adopted. Just picked up the materials on my lunch break…now to do the install. Annabelle is super playful and we wanted more than just a tie out for her. Agreed on the turnbuckle, helps eliminate the sag. If you do some shopping around you can get better prices on some things at local hardware stores instead of lowes. I picked up all the material I needed for a 100ft overhead and a 20ft lead for under $50. The cable has the vinyl coating too so it should last forever. You’re welcome! I am going to have to tighten mine up soon, so I will try to figure out the turnbuckle thingie. Believe it or not, mine survived the tornado last week even though the power line was ripped off my house and the tree next to this one was snapped in half. It was a good thing too, because another tree fell on my fence… having the cable run let Zuki have her normal exercise while I took the other two dogs out on leashes. 07/30/13: This post is part of a BlogPaws blog hop for Pet Safety Month!